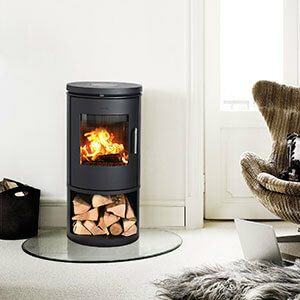 The Morso 6100-series fans the flames. The stove's unique combustion system helps ensure a higher temperature in the combustion chamber, which means it burns off the flue gases. This provides you with a cleaner and more environmentally-friendly combustion and a higher level of efficiency, guaranteeing you good fuel economy. Furthermore, the elegantly designed glass door and hidden mountings provide a good view of the fire and flames. The Morso 6100-series are 80.1% net efficient with almost no smoke emissions.